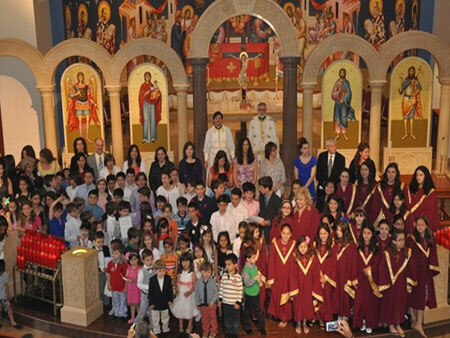 The Sunday School provides children between the ages of 3 and 18 the opportunity to attend classes and learn about the Greek Orthodox Faith. Every Sunday, children assemble in church at the beginning of Liturgy, and, following the reading of the Gospel, they all proceed to their classrooms. For more information please call the church office or contact: info@archangelmichaelchurch.org. Download your registration form for Sunday School here! Our updated schedule for the year is available by clicking here! -Christmas Pageant: Every year, children from the Sunday school take part in a Christmas Pageant. -St. John’s Oratorical Festival: This festival gives the older students an opportunity to research a topic and then write a speech that they present to a panel of judges. The winners continue on to compete at the National Archdiocesan Festival. Book titles are printed in bold and represent books recommended by the Greek Orthodox Archdiocese of America. Spero’s Orthodox Alphabet Book—Children learn the alphabet by coloring letters representative of religious symbols in the church. Happy With God—God’s love is the source of joy for children. The book examines aspects of worship and stories from Scripture that highlight examples of joy in life centered on Christ. What We See and Do in Church Bible stories for coloring taken from the liturgical calendar. Me and My World—The focus is on “Creation” as God’s gift. In discovering the world, the children begin to understand that family, friends, church and school all come from God. Loving God—Through the example of men and women in the Bible and our Saints, children begin to understand right, wrong and forgiveness in the light of God’s love. 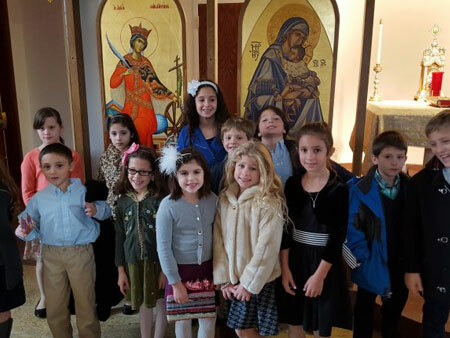 Sharing God’s World—Children learn about sharing through the examples of Jesus and are inspired to observe these examples in the Divine Liturgy, the sacraments, and other services of the church. Growing With God—Children learn how to use and appreciate the Bible. It introduces examples of living the sacramental life, fasting, praying, helping others and learning about Saints. God Calls Us—Lessons concentrate on stories of heroes whose faith has responded to God’s call. Through these examples children learn to respond to God in terms of personal faith and the basics of Christian morality. Parables of Our Lord—Children learn about the Parables of Jesus that offer basic truths for application to daily living. Facing Up to Peer Pressure—Discussions center on the challenges and positive aspects faced by our youth and the effects of peer pressure. expanded from the environment, to our role of responsibility to others and its focus toward spiritual growth. Knowing Christ—The teachings, miracles and parables of Christ are examined. Honesty—Knowing the consequences of lying, cheating and distinguishing right from wrong are discussed through the Bible and the teachings of Christ. The Christian Way of Life—Students learn about the pathways to “christian living” through scripture, tradition, doctrine, church history and liturgical life. Bible Atlas—As defined by geography, children learn biblical territories through map exploration. 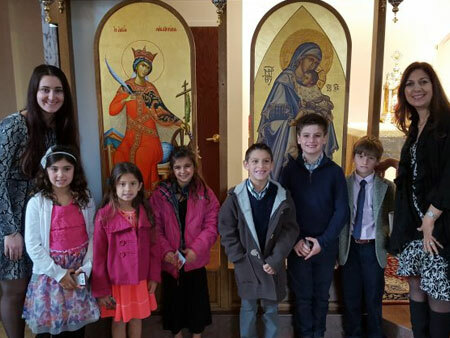 Worship in the Orthodox Church—Students learn that worship goes beyond the Divine Liturgy and is important to a Christ-centered life. The Sacraments of the Orthodox Church—Students learn that sacraments are not simply ceremonies, but truly holy experiences which transform us and lead us to a fulfilling spiritual life. Teenage Ten Commandments—This is an overview of the Ten Commandments and their relevance to young adults. Bible Study and Discussion—Contemporary issues are discussed by examining the life of Christ as stated in the Bible.